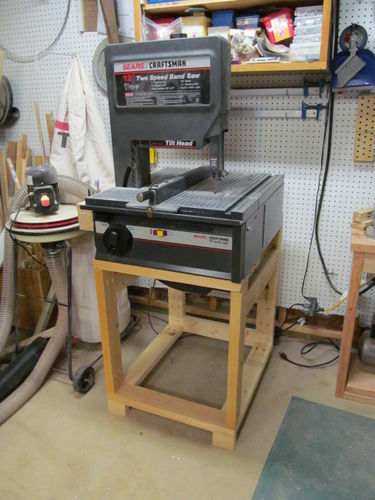 I bought my old Craftsman bandsaw off of Craigslist a sometime ago and it came with a metal stand with some nice retractable wheels. You see it here in an old shop picture. 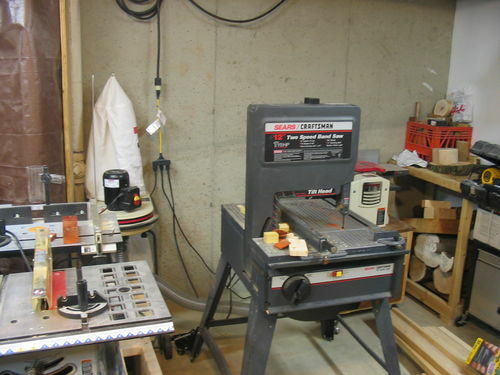 It has done a great job but I was constantly tightening the screws holding it on the stand and when I moved it into place next to my new lathe I soon was tripping over the splayed legs or killing my ankle on the wheel locks. So I finally took some time to get a new stand built for it. the best part is that I bought no wood to build this stand, just used 2x material I had hanging around the shop. 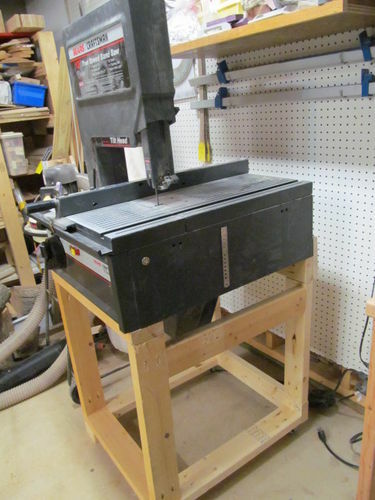 I am determined to use all of the wood I have up one of these days :) I bought two casters for this and like most of my tool stands it uses those along with some wood blocks to level and move on just the two wheels. It is way easier to move now. While I was crawling around under it, I decided to also reset the belt in order to hopefully get a better cut with it. I will know if that worked later as I still have to put my larger blade back into it. Not much of a project but I have not gotten into the shop much recently so I was quite happy with it. Hope the idea may be of use to a few others. Looks sturdy. I clip my ankles on the wheel locks on my mobile base more often than I would care to mention. Nice improvement to the old saw. Good idea and you save room at the same time. Those splayed legs are great but it has been known to trip on them.